Ever seen something so horrifying in a film that it made you sick? 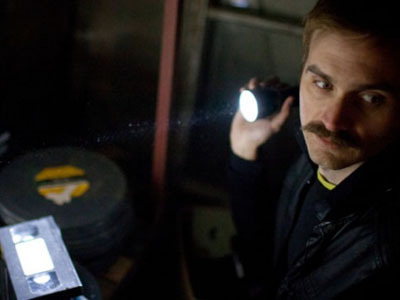 Last week, two people watching a late-night screening of horror flick “V/H/S” at the Sundance Film Festival in Utah had to be treated by EMTs — and a third woman just plain couldn’t take the film’s suspense. “V/H/S” co-writer Simon Barrett told msnbc.com that while he does think the frightening film content was a factor in the couple’s illnesses, it certainly wasn’t the only cause. The movie, which was just aquired by Magnolia Pictures, is about a group of criminals who watch a variety of homemade VHS tapes containing supernatural moments. Barrett tells us that the male viewer became sick during the film’s first segment and left the theater for the lobby, where he lost consciousness and collapsed to the floor. “Without spoiling anything, (the film’s first segment) ends with a particularly intense series of scenes that involve, among other things, an injury resulting in a compound fracture that is recorded from the first person perspective,” Barrett told us. In short: A broken bone pokes through a character’s skin, which might disturb even the healthiest viewer. While the man was being treated, his girlfriend came into the lobby as well, and vomited. She was also treated by the EMTs. Barrett said his assumption is that her illness was caused by the stress of her boyfriend’s medical issues, and less due to “V/H/S” itself. Neither viewer required hospitalization. Barrett said the filmmakers did give them tickets to a later “V/H/S” screening, though he’s unsure if they gave it another go. “The woman in particular was kind of like, ‘Uh … ‘ when we offered,” he admitted. It wasn’t the first time that “V/H/S” has created such a reaction. Barrett said that during a screening the night before, “at pretty much the exact same scene,” another young woman left the theater in tears and spent the rest of the film in the lobby. The filmmakers spoke to her briefly and she said, “I just got scared,” but she didn’t return to the theater. A domestic release date for “V/H/S” has yet to be announced.